Equine Promotions, owned by JC Events, Inc. is a management, promotional and sponsorship business with extensive experience organizing, executing and promoting competitive shows as well as horse fairs and expositions. Founders and owners, John & Judith Cloe, created this successful business over 25 years ago. Under their leadership, new events have been created and existing events have seen growth and increased success. The Northwest Horse Fair and Expo has become an annual tradition for horse owners and horse lovers in the Northwest. 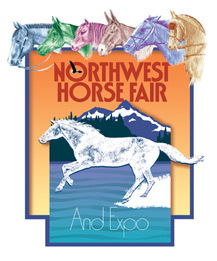 The Northwest Horse Fair & Expo combines to the highest degree, first rate education, entertainment and shopping. Whether you own horses or are a horse lover at heart, are a beginner or professional, are interested in dressage or trail riding, there is truly something for everyone. It’s three days of fun the entire family can enjoy. © Equine Promotions, JC Events Inc.